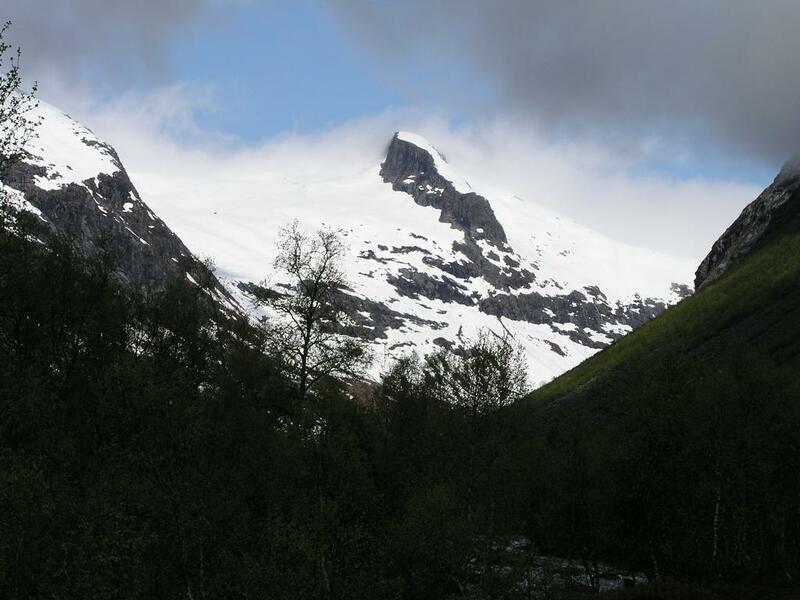 How to get there: Drive from Stryn (or from Nordfjordeid) to Hornindal and continue towards Hellesylt. After about 18 km you reach the farm Tronstad. The road curves left and a side road to Kjellstad crosses the river on your left hand side. Take this road across a first bridge. There is good parking on the right just before this small road crosses a second river. One can naturally also arrive from Hellesylt. Route description: Walk from the car across the second bridge, then up towards the farm Kjellstad. Turn left and locate the dirt road that heads left (south-west), slightly higher than the farm itself. Follow this road into the beautiful Kjellstaddalen valley. As the road turns north-west you will notice two creeks coming down from the mountains on your right hand side. The first one is rather small, while the second, Tverrelva, is clearly visible as it cascades down from the mountain above. The route heads up just after this creek. In fact, after about 3 km, the road ends and you will see a small cabin on your right. Head up passing this cabin and continue as you approach the creek. The best place to cross is about 50 meter below the long cascading waterfall from above. At this place, there is a narrow "island" that divides the creek and quite a few good rocks to jump to/from. The GPS coordinates of this location is North 62:03.170, East 006:44:336. After crossing the creek, locate the trail that heads up the slope in the birch forest. This trail is quite visible and runs upwards parallel to the creek. Just below the 700 meter contour (near the top of the fairly steep slope), the trail forks and the right fork is best, despite a short section where hands may be needed (YDS class 2+). The upper part is otherwise quite complicated for hikers with skis on their backpacks due to the combination of steepness and horizontal birch trees. Gain more level terrain on a ridge right close to the creek, we hit snow at about 750 meter on May 30. This location is north 62:03.556, east 006:44.210, only 726 (horizontal) meter from the creek crossing, but almost 300 meter above. From this point we skied, climbing sort of parallel with the creek in the beginning, later crossing back west in order to climb Kvanngrønibba at 1495 meter. Actually, it is best to contour about 50 meter lower on the east side (right side), and gain the saddle north of this point. The route continues more north-west and climbs point 1587, then west along a more pronounced ridge. Watch for cornices on your right (north) side. After descending slightly off this ridge, the route turns more north and climbs the final slope to the summit. WP 6: 62:05.485 006:42.189 - 4.3 km. 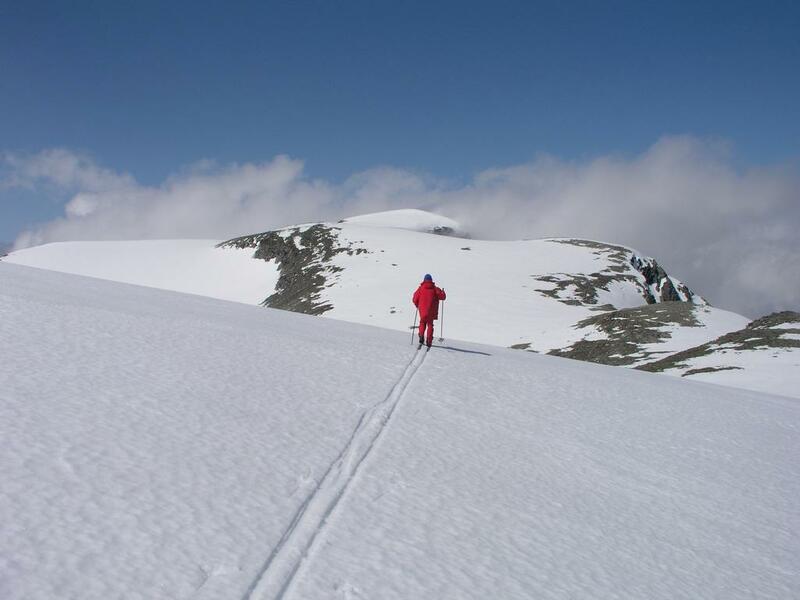 The summit was 4.7 km from the point we started skiing, as measured via the way-points given above, The summit cairn is further west and about 26 meter lower, the higest rock point, This location is north 62:05.665, east 006:42.000. Comments: I did this climb with my son Pål Jørgen and my friend Jan-Frode Myklebust. It took us 6 hours up and 3 down, including generous stops to enjoy the view and the good weather. Hornindalsrokken, as seen from Kjellstaddalen. Kvitegga, as seen from Kvanngrønibba. 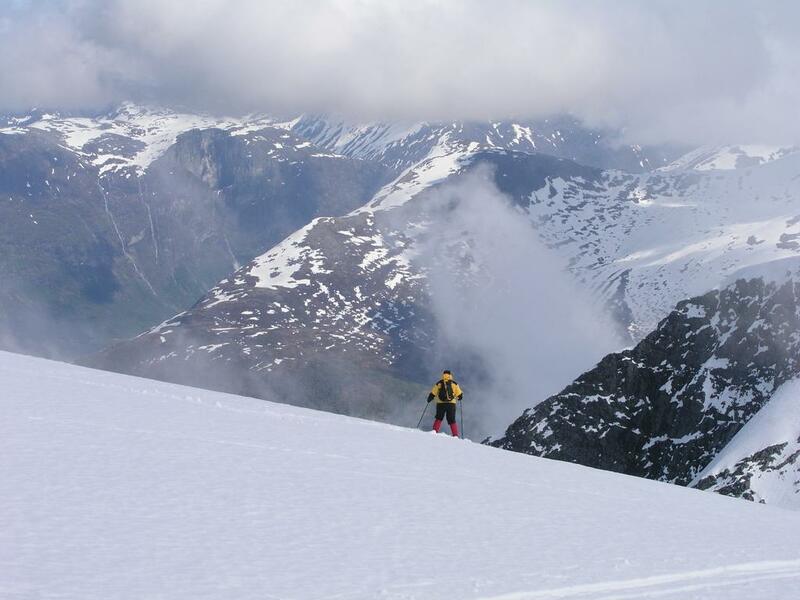 Pål Jørgen on the Kvitegga summit. 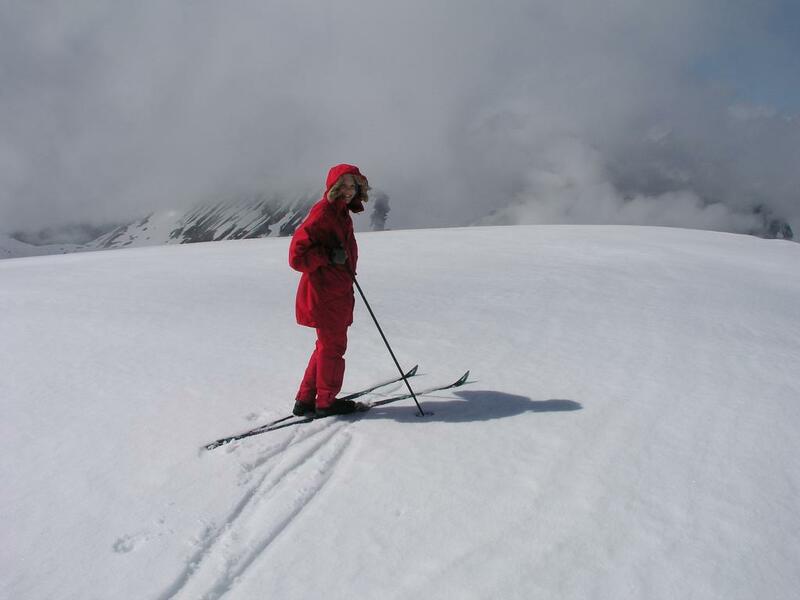 Jan-Frode skiing in a dramatic landscape.